However, the minivan driver again demonstrated all his professional abilites, so after one hour of sweating faces, some hectical back and forth and exchanging some tools with other bus drivers, we were again ready to go. 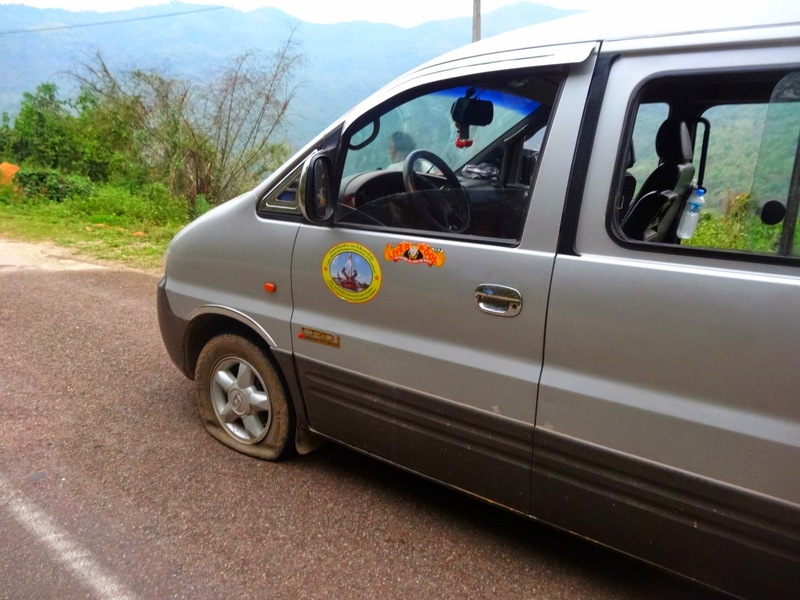 During the ride I noticed that we were leaving the mountaineous areas of northern Laos, as we descended to flat land, the so called Xieng Khouang plateau. 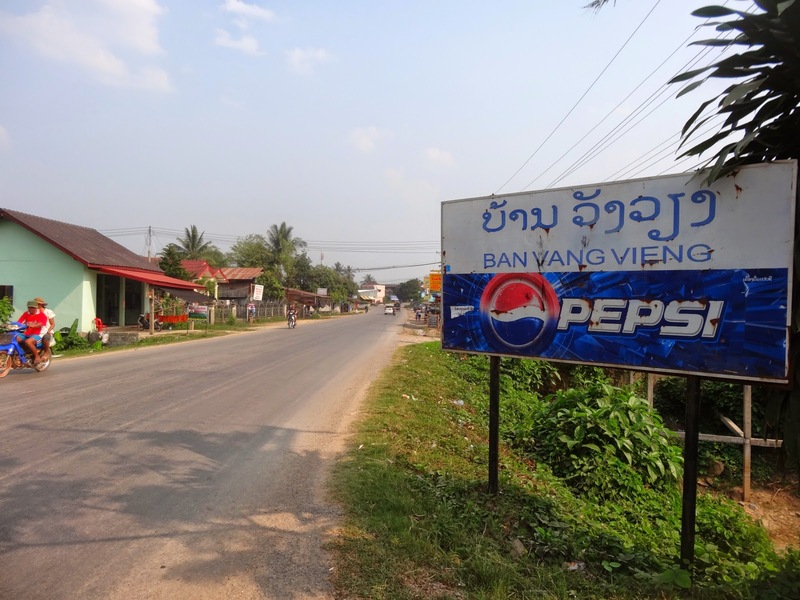 Soon afterwards we arrived in Phonsavan, also known as Xieng Khouang. 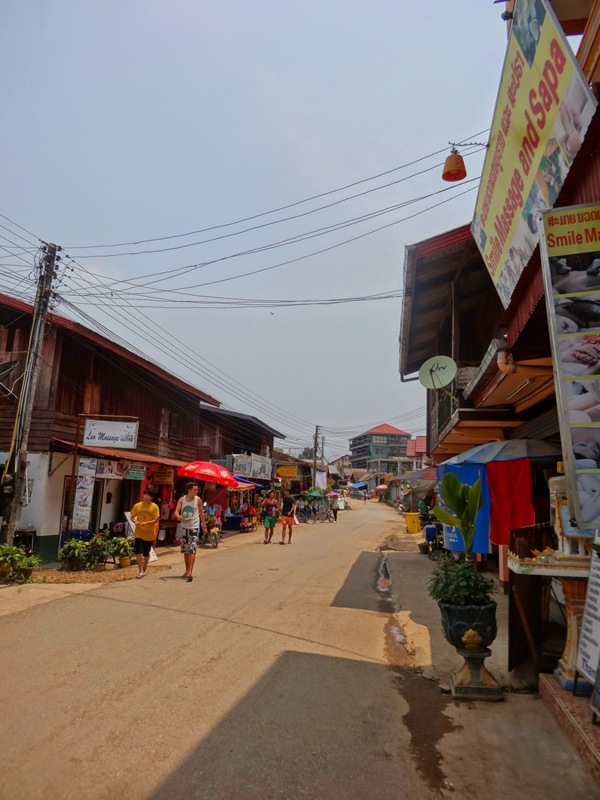 Phonsavan, a regular town in South East Asia. Here I noticed that the Civil War of Laos still was omnipresent in town. 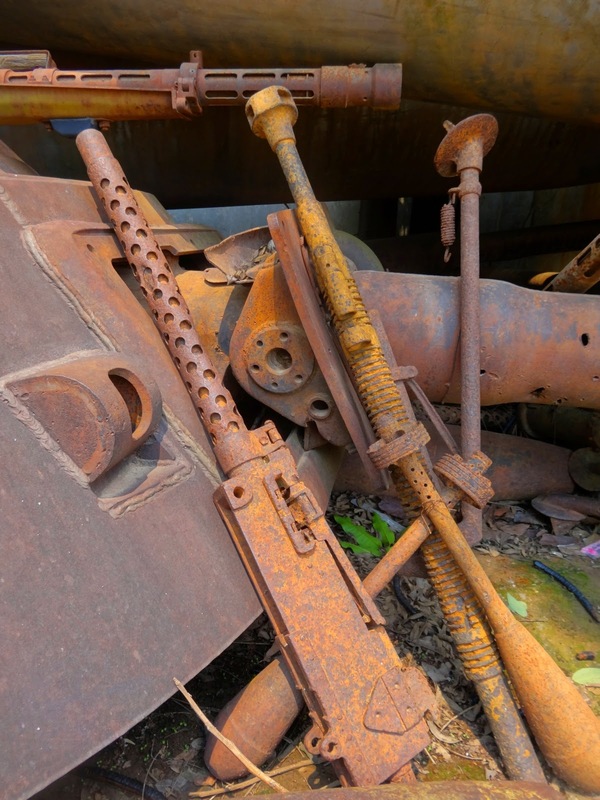 The locals actually decorated their whole furniture with deactivated plane bombs, mortar shells, rusty machine gun barrels, RPG grenades and much more.Why's that? Read on. ... Phonsavan, where the war is still omnipresent. 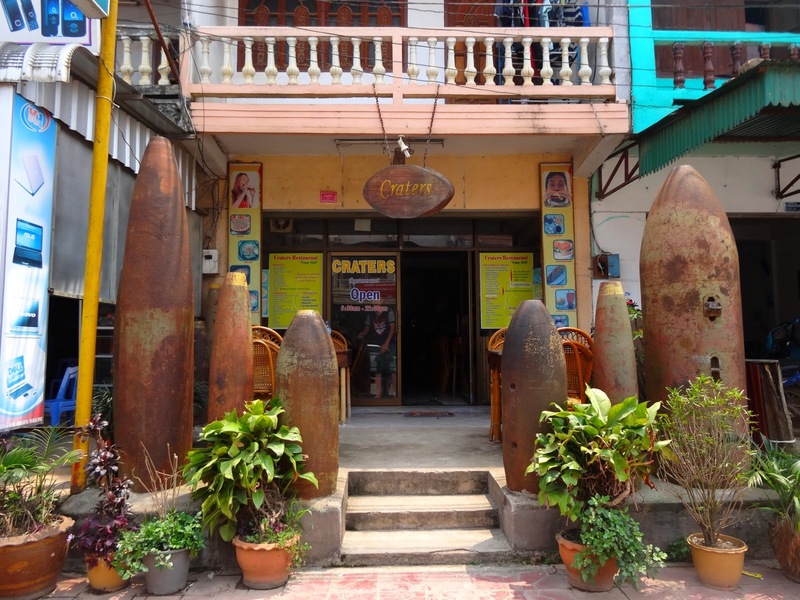 Where else in the world you can eat a plate of «Laap» (the Laotian National dish) next to deactivated 1000lbs bombs? 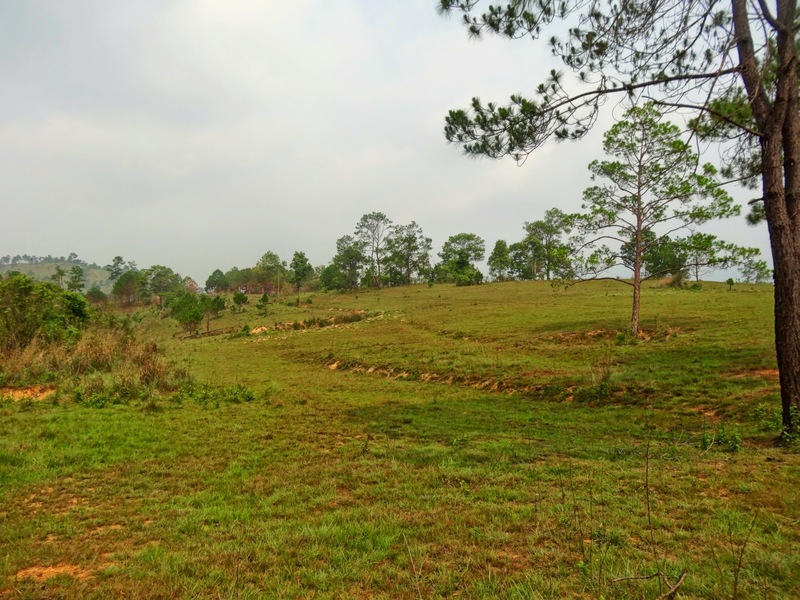 If there are any tourists in Phonsavan, the probability is high that they only go to see the Plain of Jars and then head further to party towns like Vang Vieng or Vientiane. But not me. 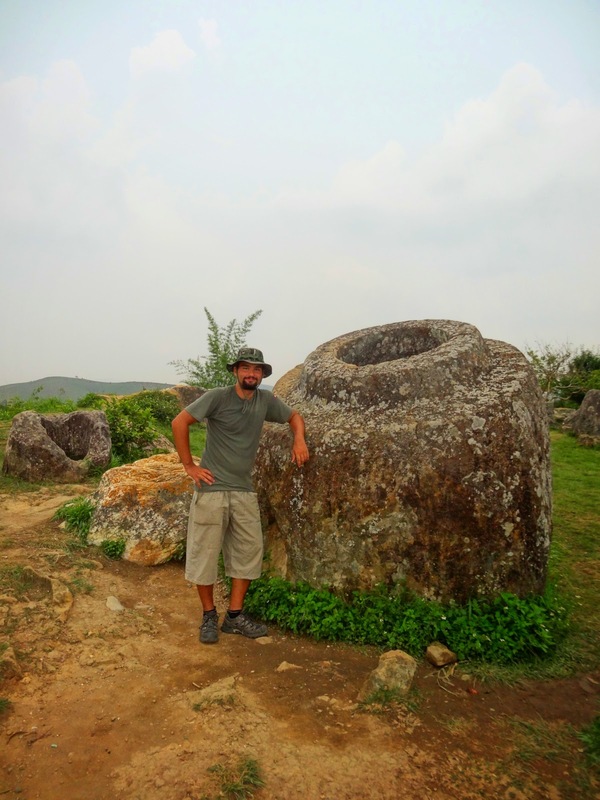 Let me first tell you some stuff about that Plain of Jars. 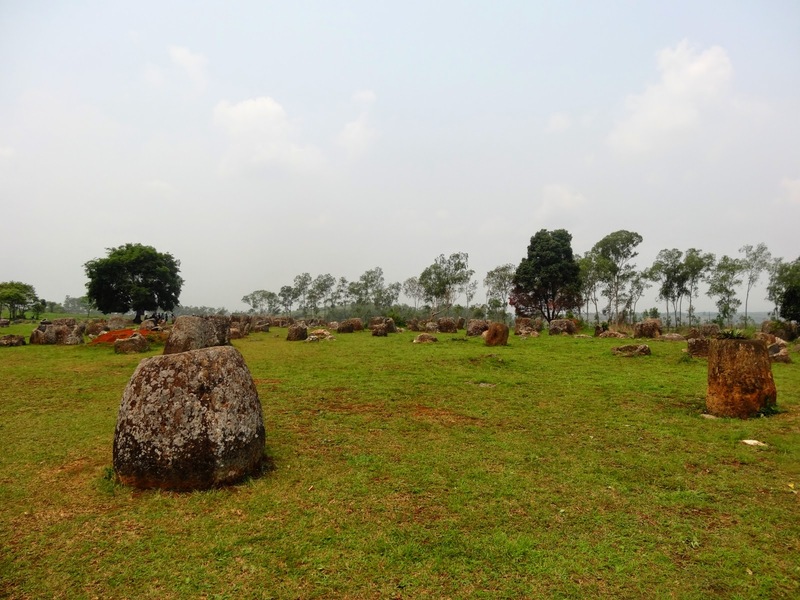 ... of the mysterious Plain of Jars. 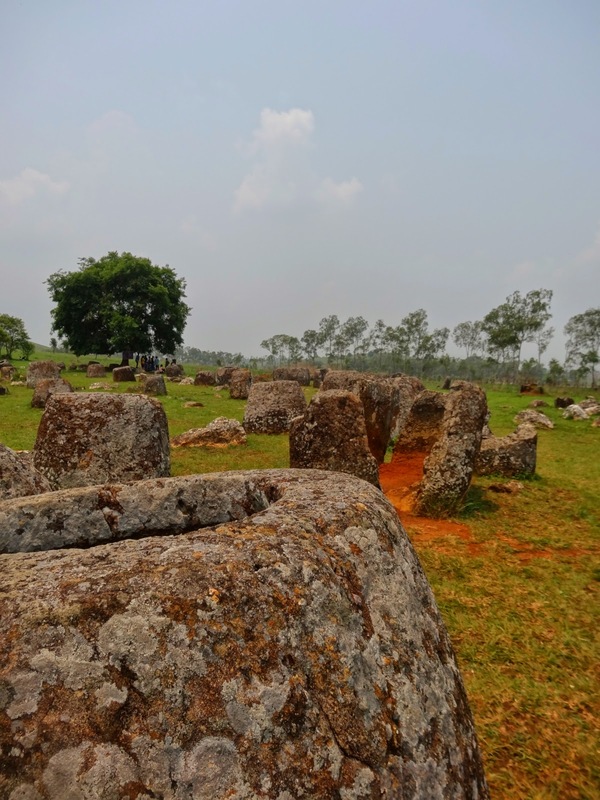 The Plain of Jars is basically a huge archeological excavation site where over the flow of time huge stone jars were discovered. While these may first look boring to laypeople, they actually are still a huge mystery to many archeologists and historians, as nobody really knows which culture or ethnic group constructed those jars. It's not even quite clear what those jars' actual purpose was. Some archeologists came to the conclusion that they were used as cinerary urns, while other specialists think that the ancient locals would collect rain water with them. 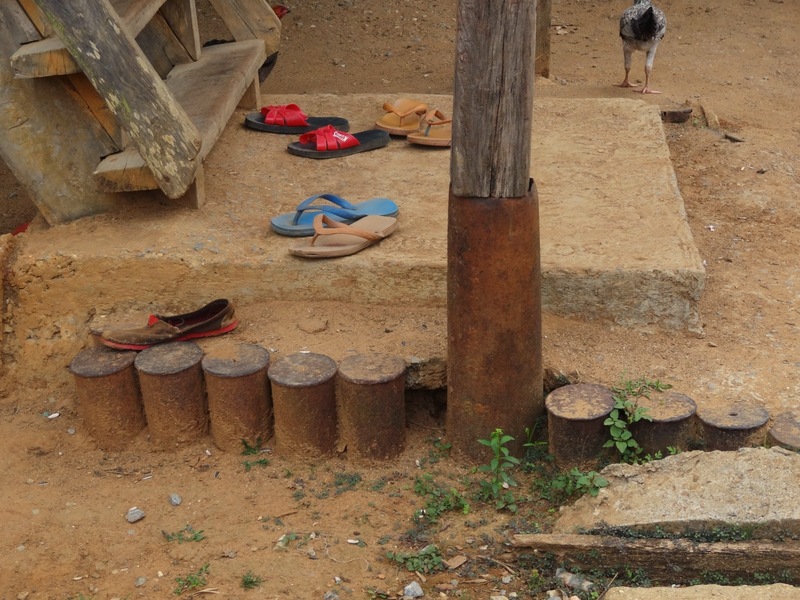 Many locals actually claim to hear strange noises coming from the Plain of Jars at night, allegedly caused by the spirits of their forefathers who still wander around next to all those jars. 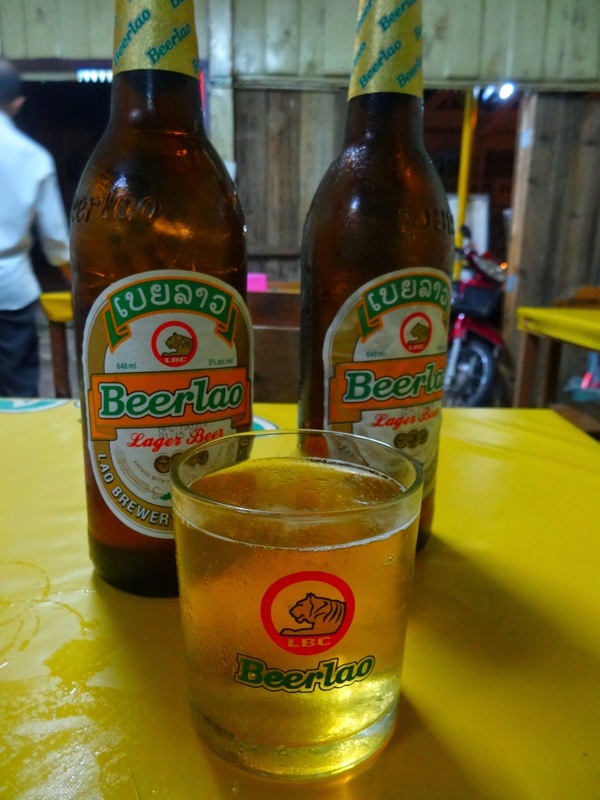 At least that's what a Laotian guy told me, almost trembling with fear. Anyway, I would best compare these Jars with the Moai heads of the Easter Island, mysterious and megalithic. ... it also bears a dark past. Wait... what? Americans? 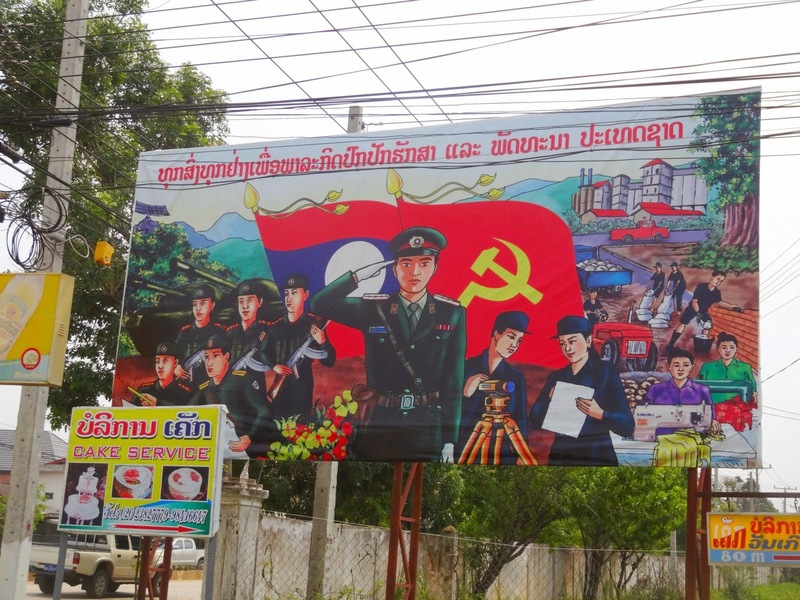 Communist Laotians? Vietnamese? Hmong people? And now even Thais? I may understand your confusion, but the whole story isn't as complicated - it was just considered secret for quite a long time. 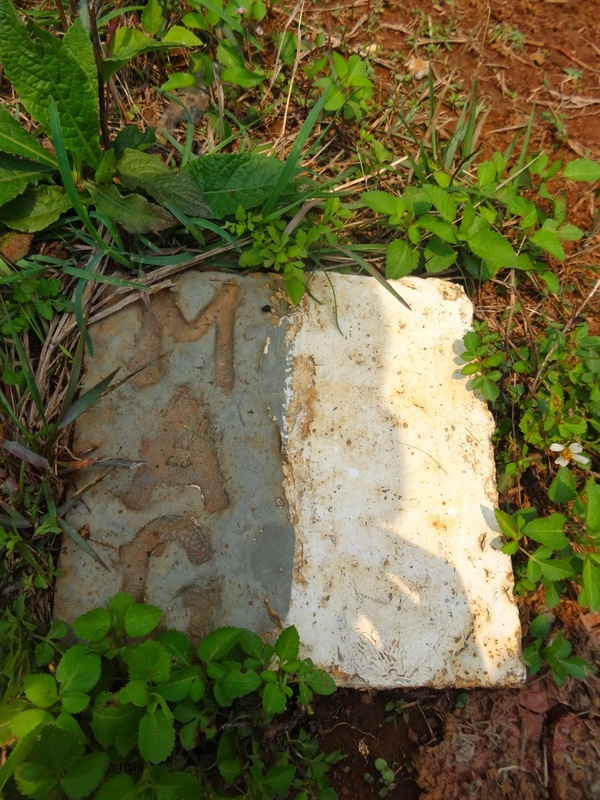 ... communist military advisors on the Plain of Jars. Let's go back to the beginnings of the 1960s. In almost every country in South East Asia there's a proxy war raging on between East and West, Communists against Nationalists, forces supported either by the Warsaw Pact or the USA. Here in Laos the Royalist Nationalists were facing the Pathet Lao, who were politically and militarily supported by North Vietnam. 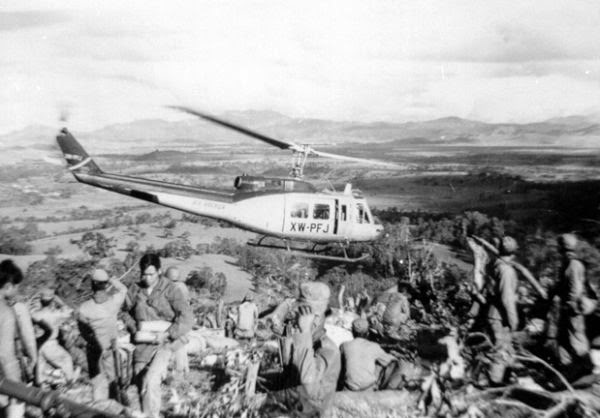 As you already may know, the North Vietnamese smuggled soldiers, weapons and other supplies through the Ho Chi Minh Trail in the eastern part of the Laos, with the goal of arriving in South Vietnam and to equip there the National Liberation Front (better known as Vietcong). 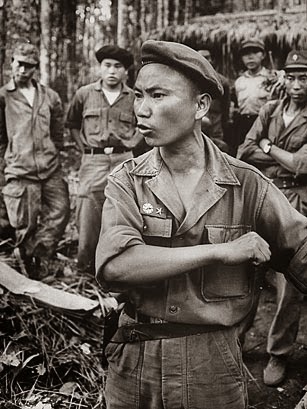 The communist Pathet Lao supported the North Vietnamese Army by offering them shelter and free transit through their occupied territory. 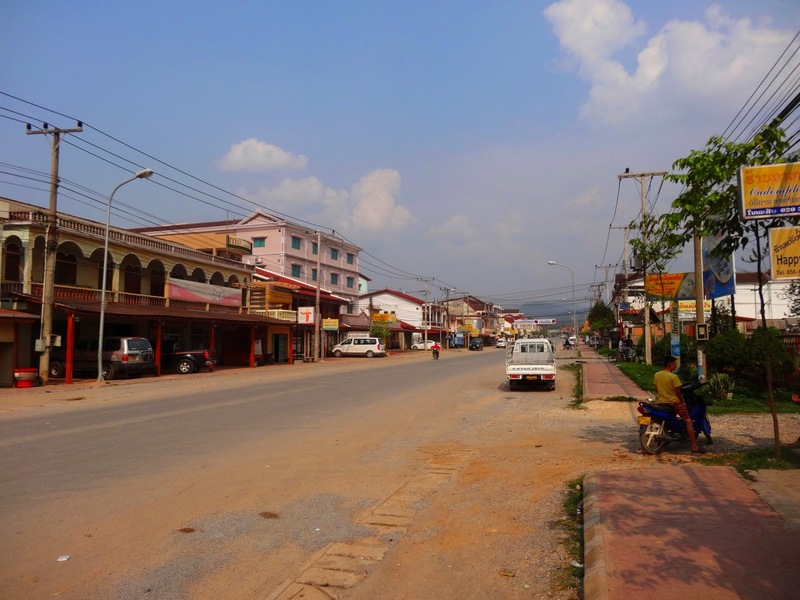 But because the U.S. couldn't officially engage in open combat in Laos due to the Neutrality Agreement of Laos, they first only supported the Nationalist Royalist forces (who had their headquarters and government in the capital Vientiane) by giving them arms and advice. 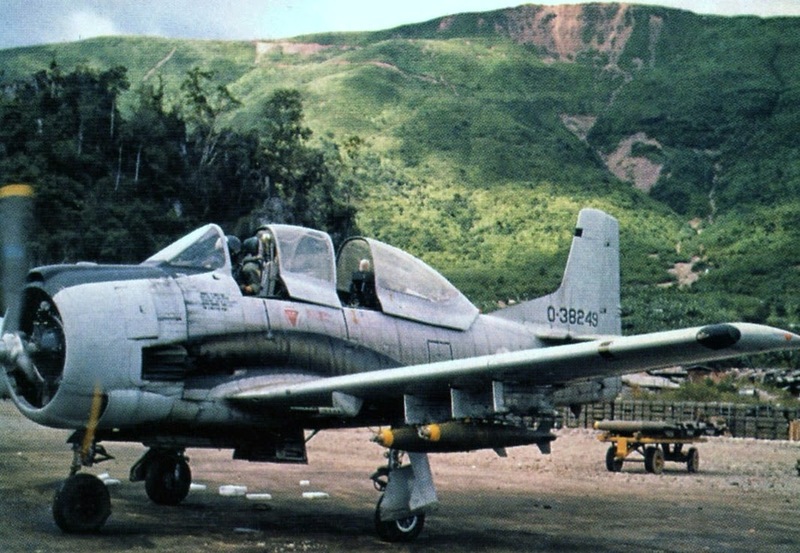 Since then the Laotian Royalists would fly continuous air strikes against the Pathet Lao; the iconic T28 attack planes were of course supplied by the United States. But soon it was clear that the Royalists simply hadn't enough firepower against the Pathet Lao, who on the other side were directly instructed, supplied and trained by the experienced North Vietnamese. Therefore U.S. needed more to successfully engage the communists in Laos... Here's where the interesting part begins! 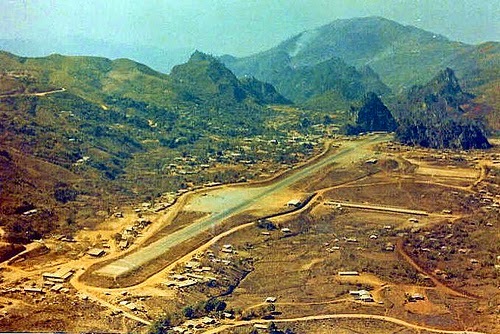 With John F. Kennedy's unofficial blessings the world's largest secret service, the Central Intelligence Agency (short CIA), began to erect secret training camps in Northern Laos, in the middle of nowhere and isolated from curious eyes. 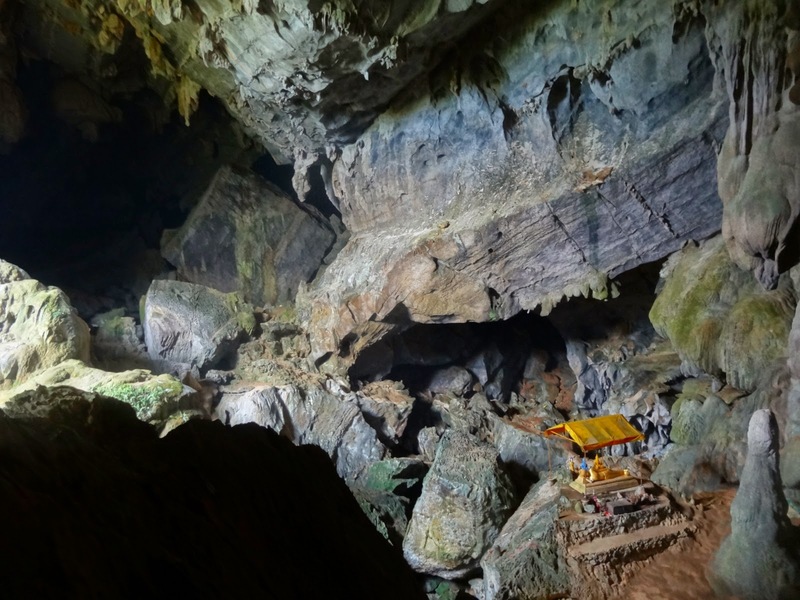 The secret plan was to recruit a shadow army consisting of local hilltribe people, most of all from the Hmong tribe. 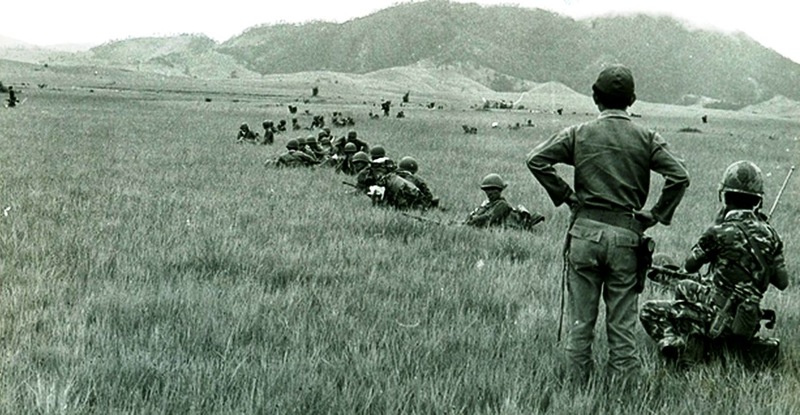 The CIA instructors offered those primitive people food, education and of course combat training, as long as the Hmong would fight the communists in the area. Responsible for the flow of supplies was the company Air America, a CIA-owned airline that secretly flew in CIA advisors, tons of weapons, medicaments, food and other everyday needs. On the other side Air America would fly out Opium, rescued prisoners of war or Hmong people who seeked exile in the USA. This whole camp setup was top secret, and the American public and even the congress were not aware of this huge CIA operation! Only shortly before the war's ending the whole story finally became public as several reporters and newspapers found out about it. 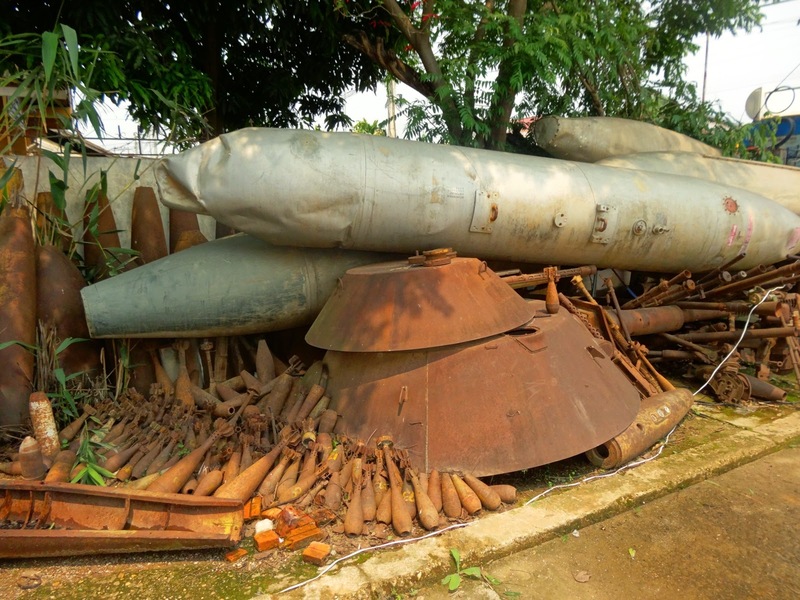 Therefore this historical event became known as the so called Secret War in Laos. 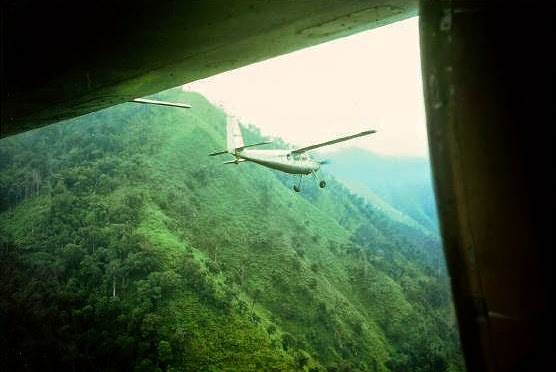 ... and planes flying in equipment to Laos. Soon afterwards those small training compounds became huge towns with long airfields, barracks, hospitals and even entertainment facilites. While the CIA instructors were having fun with local girls, booze and western music (live bands! 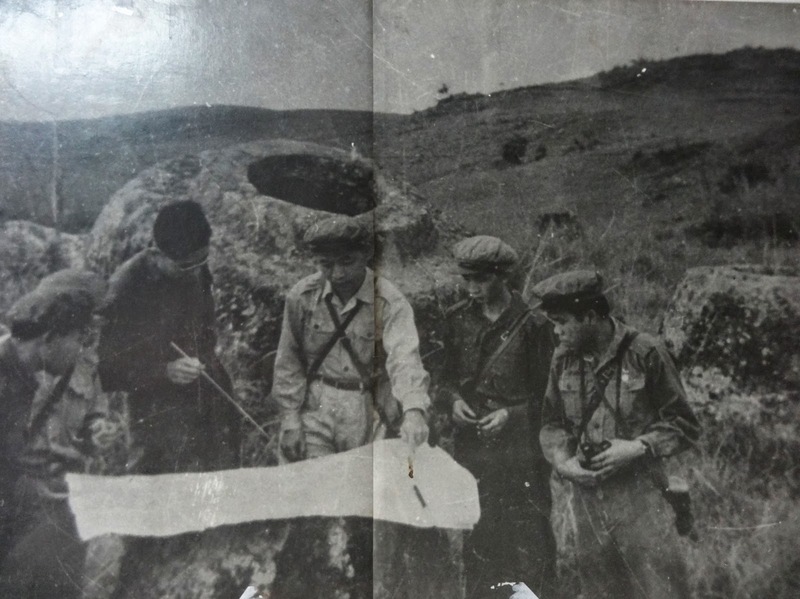 ), just next to them the Hmong shadow army began to grow bigger and bigger. One of the most iconic Hmong fighters was General Vang Pao, the selected leader of the Hmong shadow army. 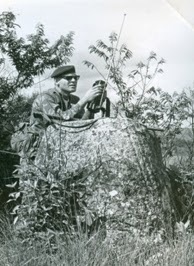 He was the very military leader who organized and planned the attacks on the communists on the Plain of Jars, back then a very important strategic plateau in the fight against the Pathet Lao, and perhaps the only gateway to stop efficiently the flow of supplies on the Ho Chi Minh trail. 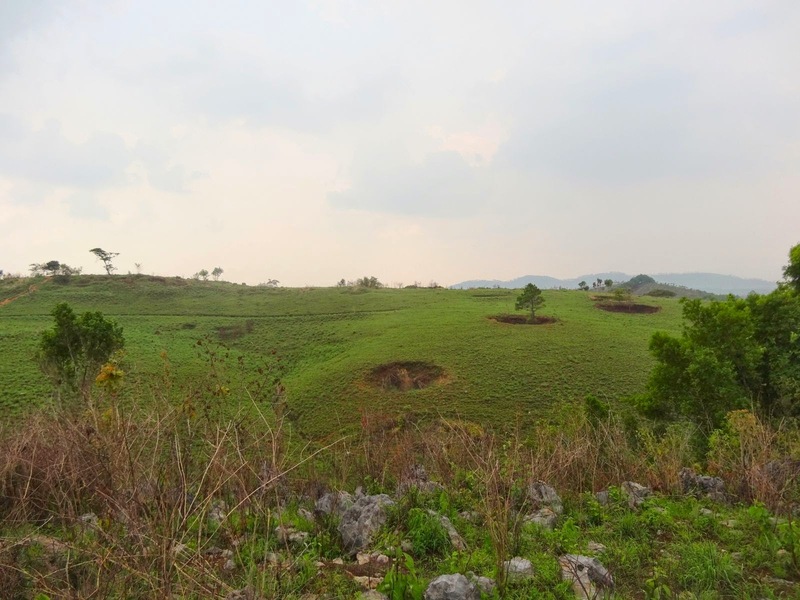 ... who was ordered to grab the strategically important Plain of Jars. 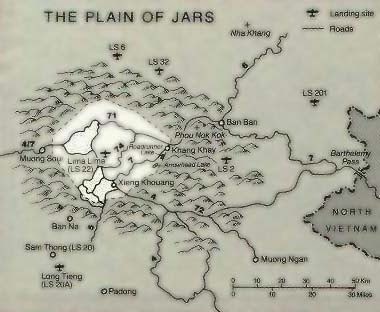 Since then the War in Laos began to take a dramatic scale; both sides conquered multiple times the Plain of Jars and casualites began to rise. 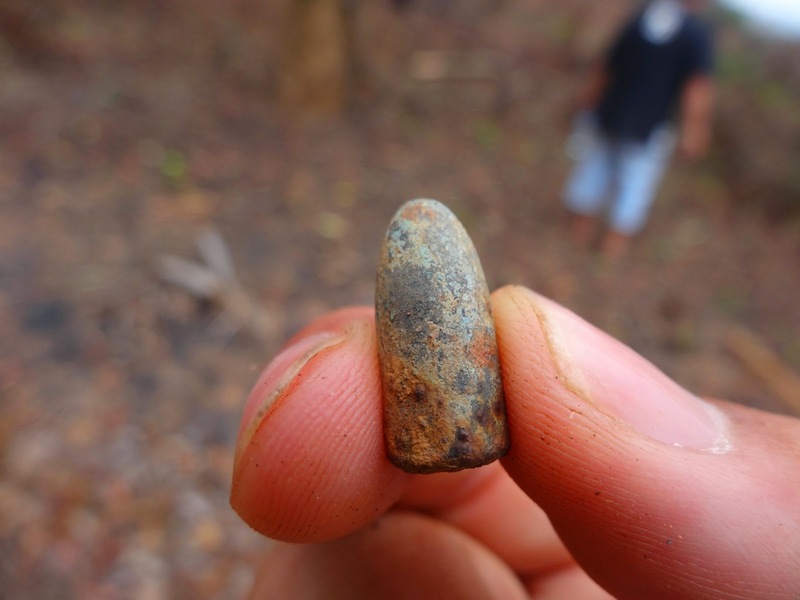 To back up their Hmong «friends», the U.S. began to fly in Thai mercenaries to support the shadow army. The idea behind this was that Thais pretty much looked and sounded like Laotians, so the presence of Thais in Laos would give the international community the impression that this was still a war fought between Laotians and without the direct intervention of the US. 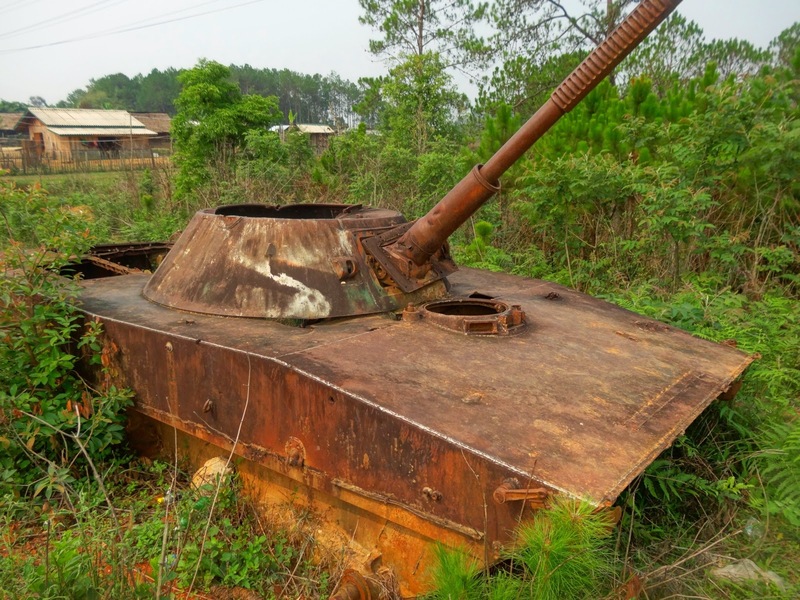 On the other side the North Vietnamese Army also directly interfered in the battle of the Plain of Jars by sending in combat troops, vehicles and equipment. Things got worse when the United States declared the Air War on North Vietnam in 1965 (read my previous blog post). 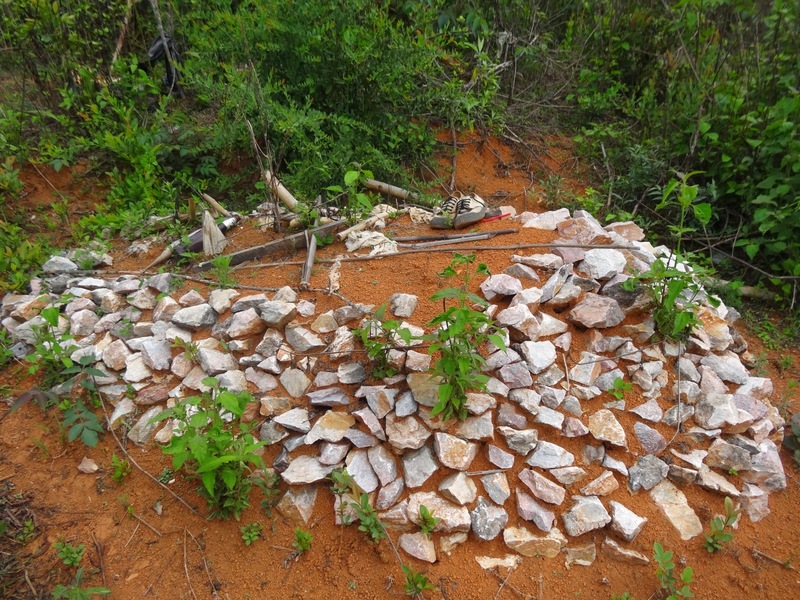 Since then the U.S. Air Force (stationed in Northern Thailand) would also directly strike communist targets on the Plain of Jars «while they were on their way to North Vietnam». The result of all this? 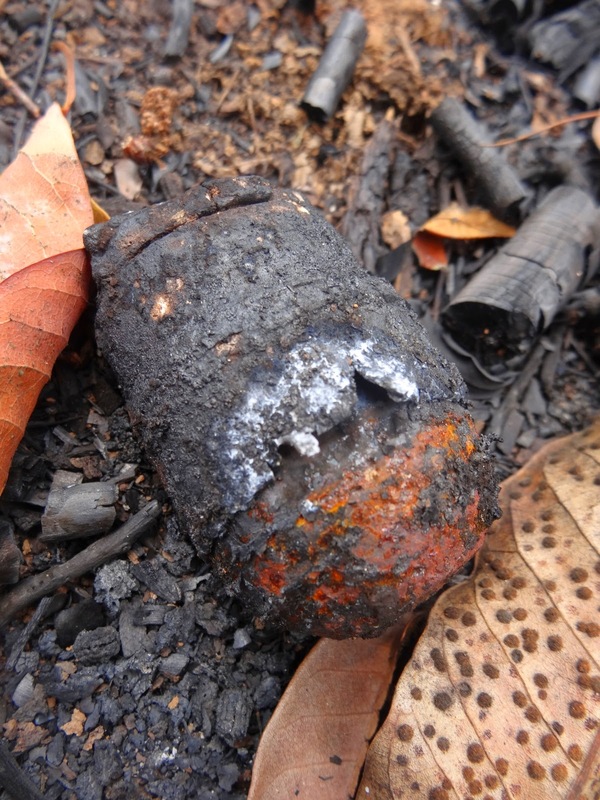 Until today the whole Xieng Khouang plateau is contaminated with unexploded ordnance of all different kinds. 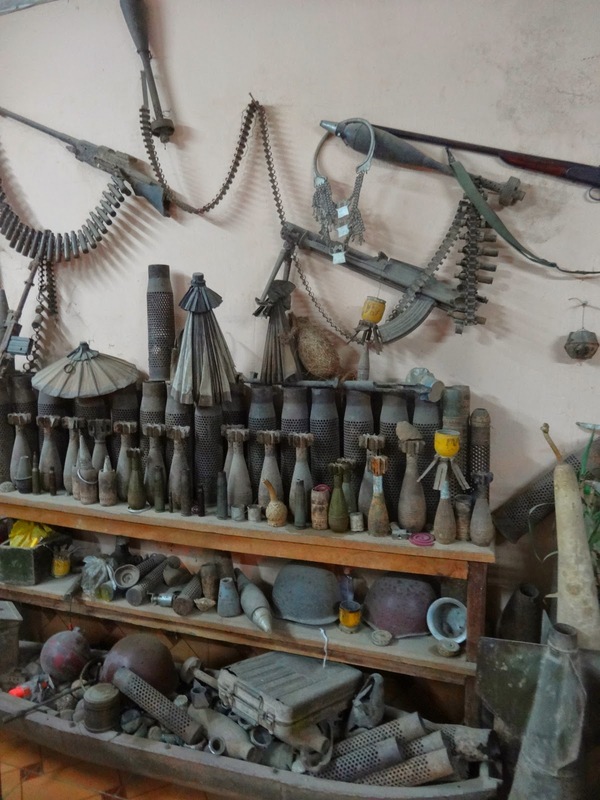 From 500lbs plane bombs, over to mortar shells, claymores and hand grenades you can find pretty much everything. ... massive U.S. bombardments. 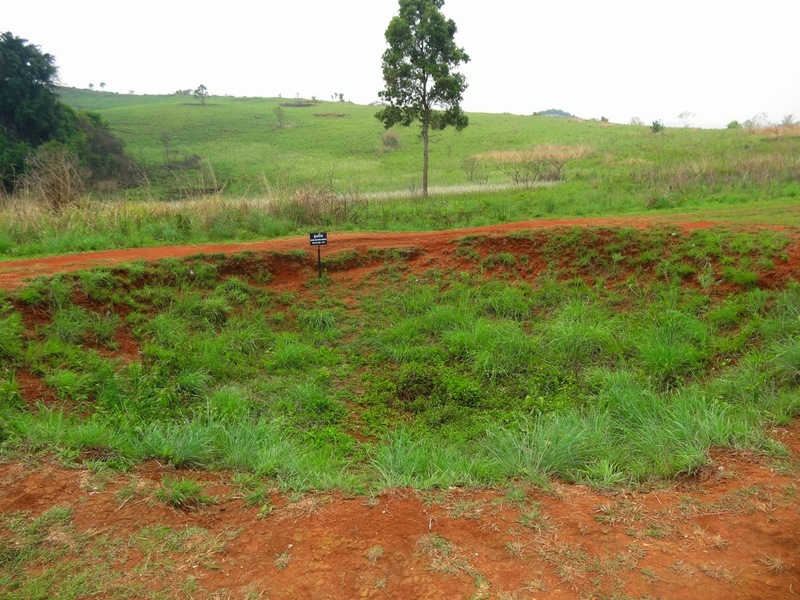 Note this 5 meters deep bomb crater here. 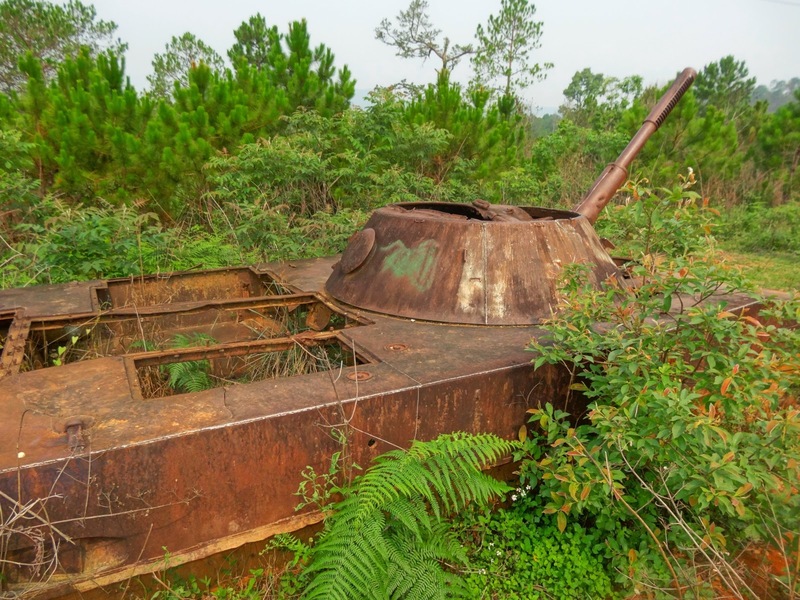 But even with the massive involvment of the CIA, the Royalists, Hmong soldiers and Thai mercenaries, the allied forces were not able to drive away the communists out of the Plain of Jars. 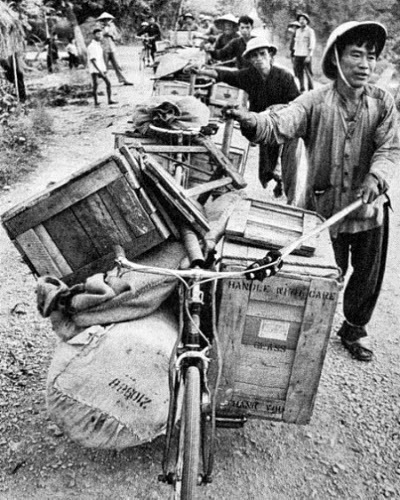 The North Vietnamese even increased massively the flow of supplies on the Ho Chi Minh Trail and nothing (not even B52 carpet bombing) seemed to stop them. As we all know, the fighting in South East Asia ceased in the mid 1970s and the communists came to power in Vietnam, Laos and (sadly) in Cambodia. 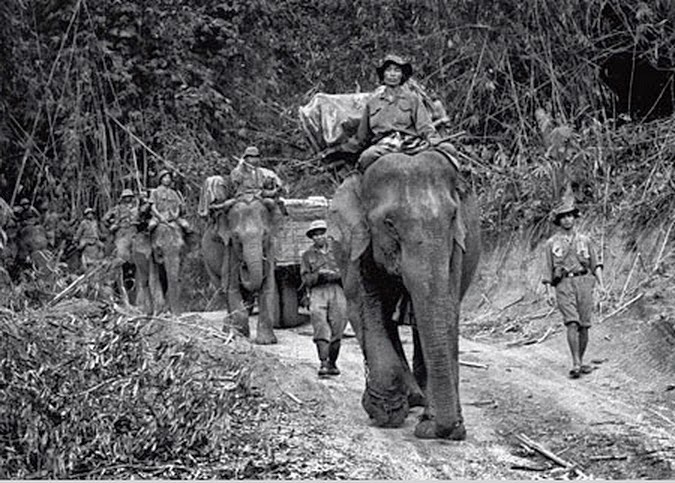 Finally the CIA escaped from Laos, took General Vang Pao with them along with some more Hmong people and left behind the sad rest of the shadow army in Long Cheng. The whole story awakened my attention - this is quite a location of interest! 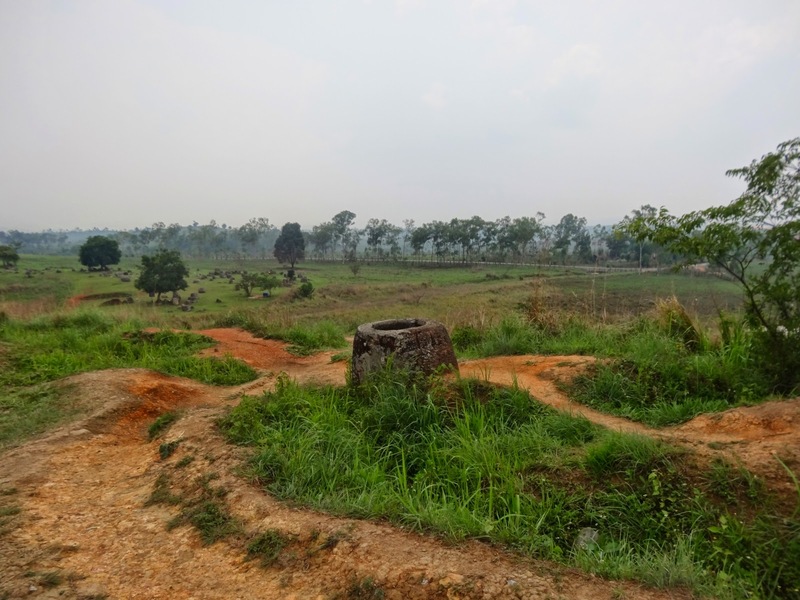 After visiting the Plain of Jars I asked a local guide if he could take me to other places that still bear the scars of war. No problem, after a few kilometers we landed on a unsuspicious field with scenic hills and trees - even pines were growing here! Only a rascal could claim that there is any danger coming from this place. No chance, biatch! 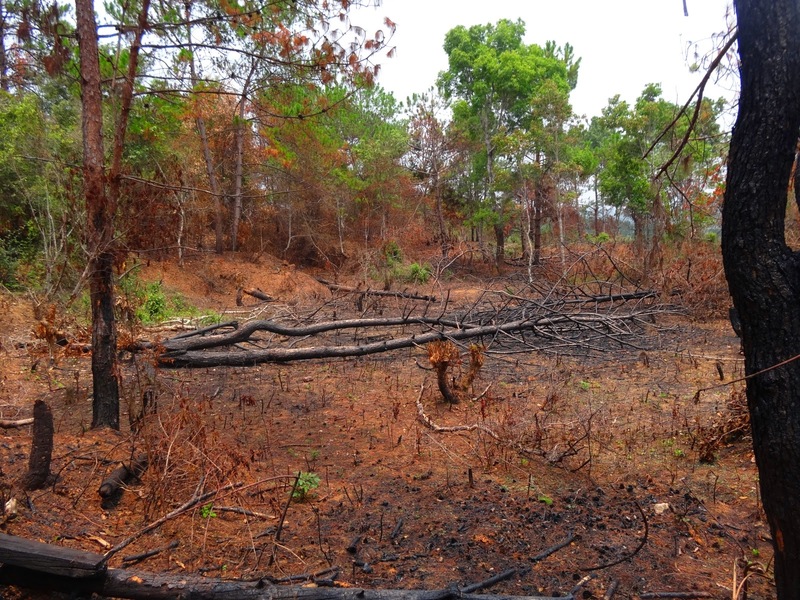 This field here used to be a camp for Thai mercenaries. Some traces of former fortifications still can be seen. 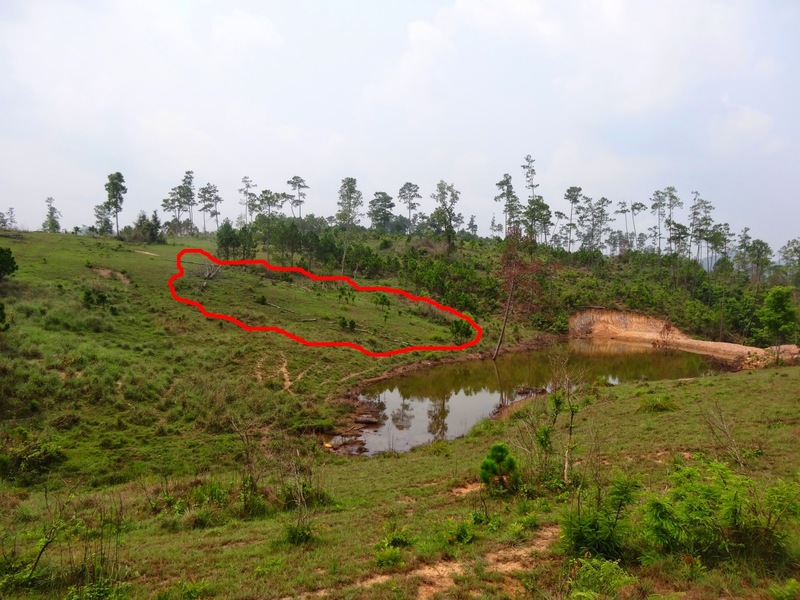 ... while neraby on the other side several minefields lay (encircled). It's needless to say that we were careful enough where to put our feets on. 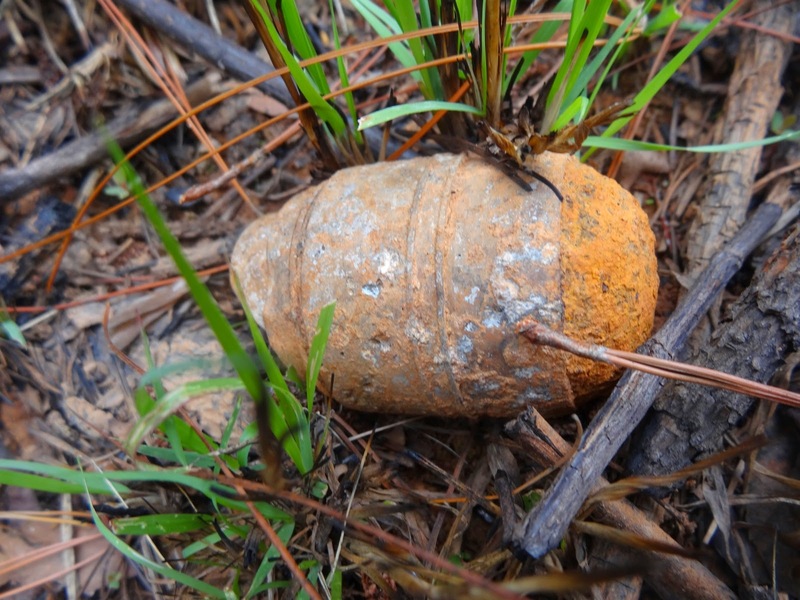 It wouldn't be a good idea either to pick up an unexploded cluster bomblet and to play with it. Dear Kids, NO! 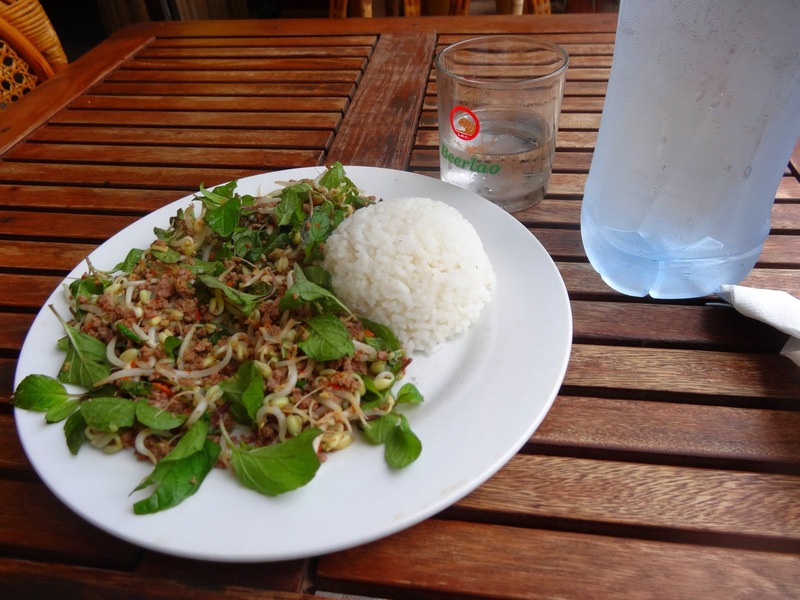 Afterwards we went to visit a rural Laotian family, who invited me to their house for a small snack. The head of the hospitable family was a 85 years old grandpa, who has seen pretty much everything in his life. 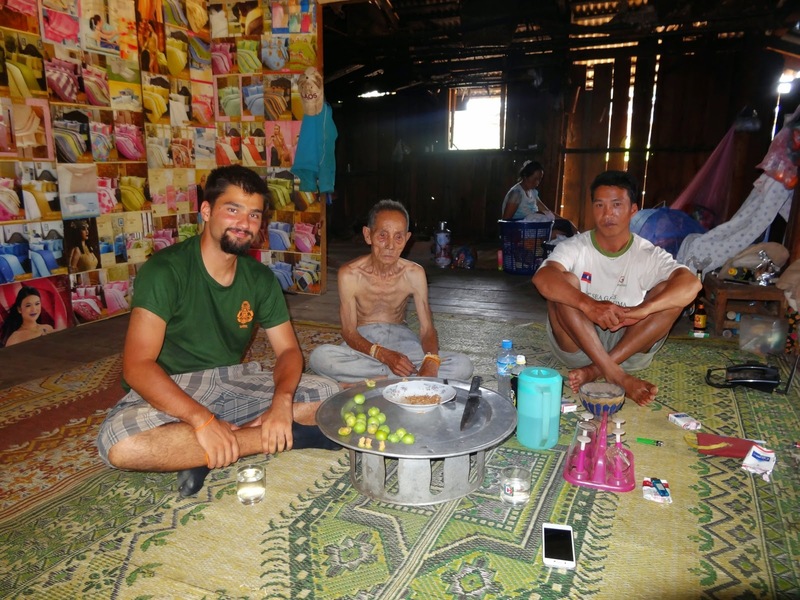 While offering us sour fruits and Lao Lao (the local, very strong rice whiskey) he told us that he's only weighing 35kg! But even then he made a solid impression and was still working around his humble house. ... which is built on bomb tails. 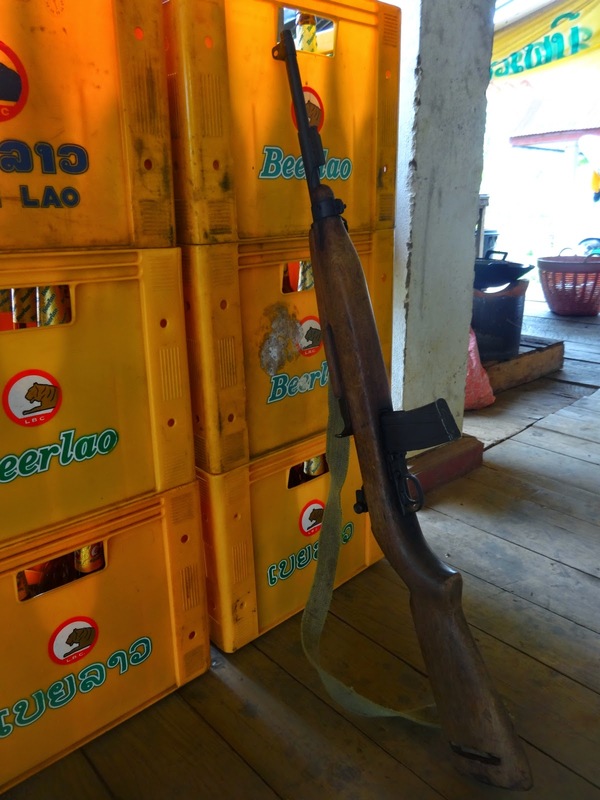 Beerlao and a M1 Carbine... Bundle of fun! A traditional Hmong tomb. Note the crossbow on it! 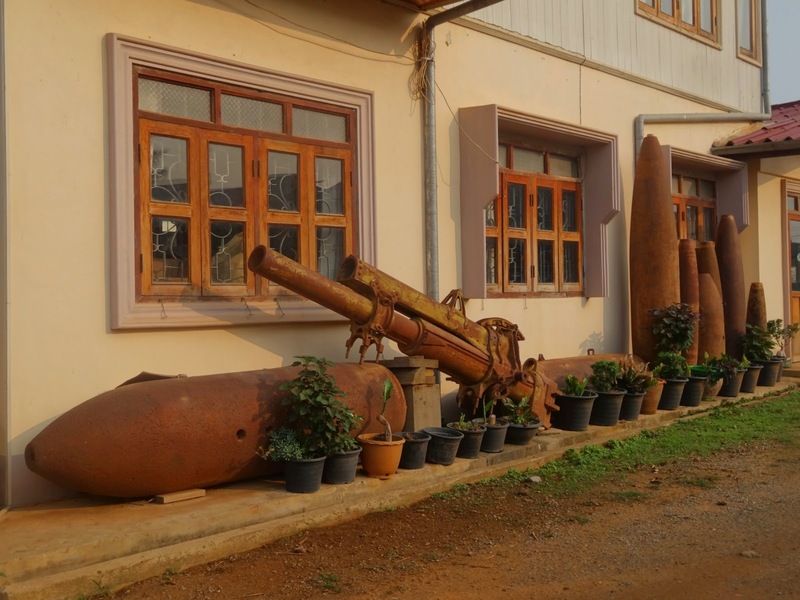 ... a howitzer barrel as front garden decoration? Enough Phonsavan for today. 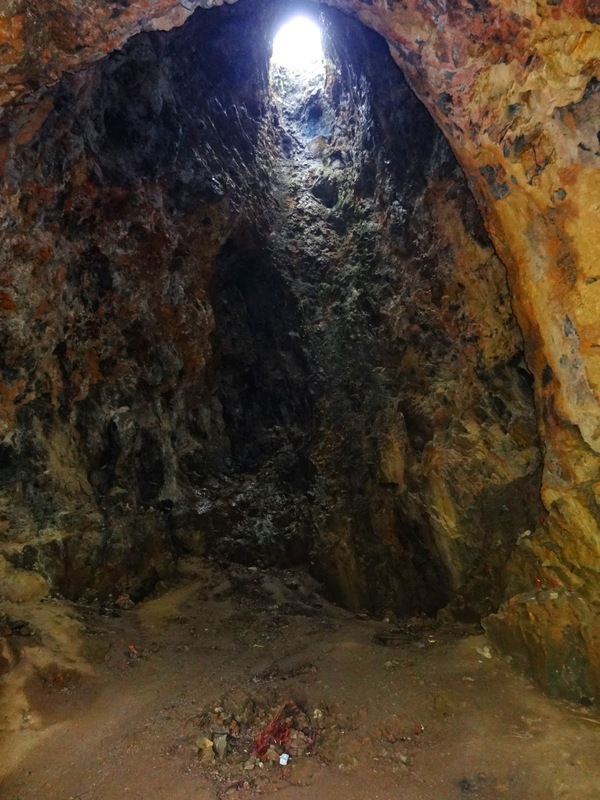 If you guys want to learn more about the whole topic I highly recommend the documentary Bombies, the before posted one 'The Most Secret Place on Earth' or Peter Alan Llyods excellent posts on his blog. 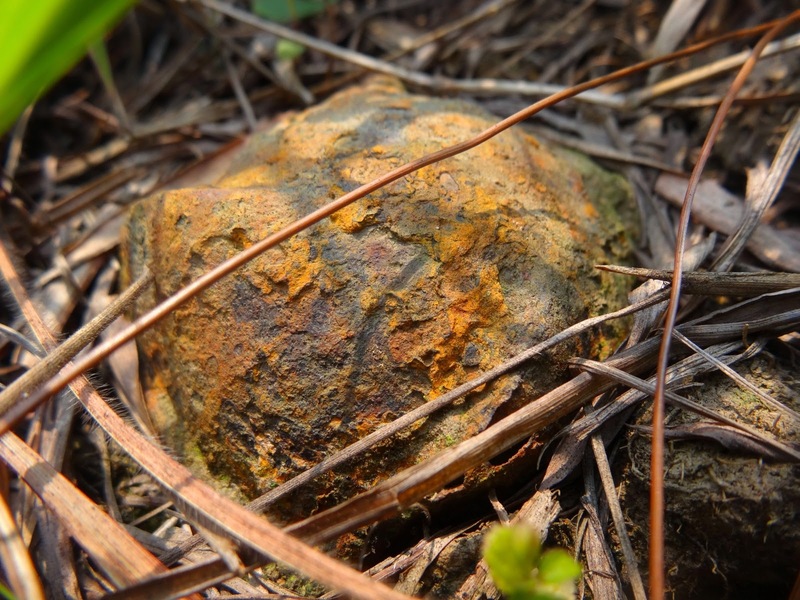 It's worth to know more about it, as the locals still suffer from the UXO and the aftereffects of the war. 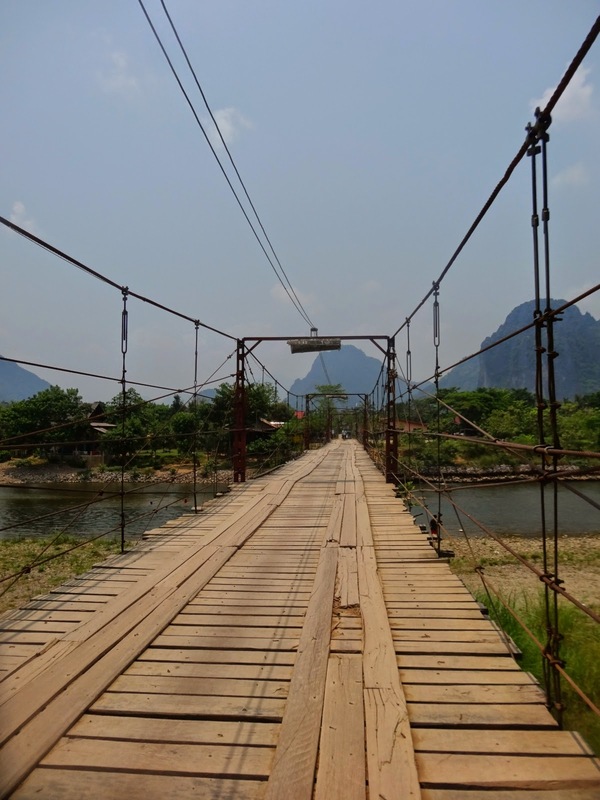 After Phonsavan I head further south to the party destination Vang Vieng, which is famous for the tubing on the nearby river. 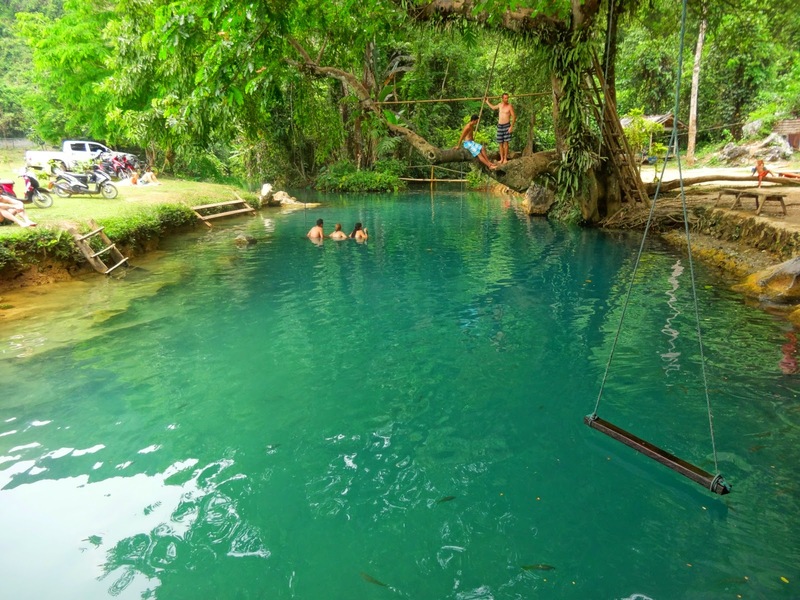 While I wasn't particularily keen on that tubing (too many farangs, too shallow waters, too boring) I still had 2 enjoyable days there. 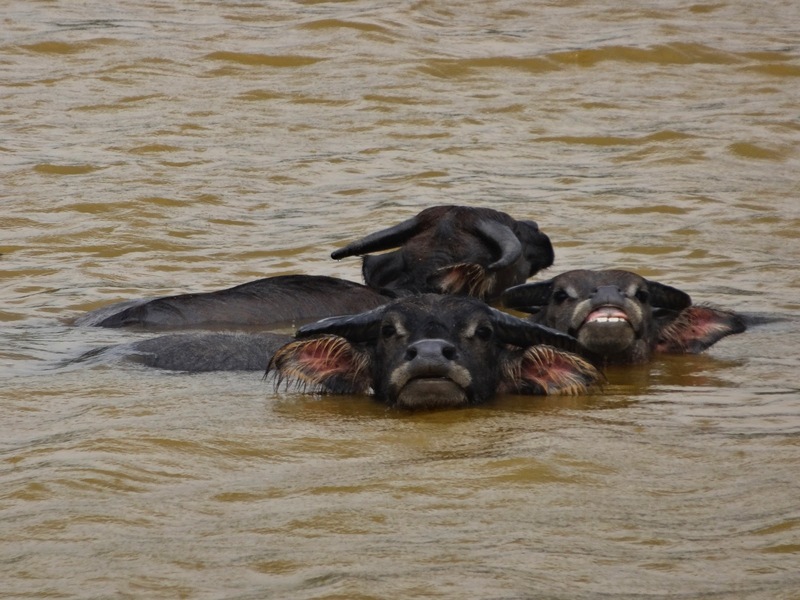 ... south of Luang Prabang. ... where «harsh» laws were ruling. 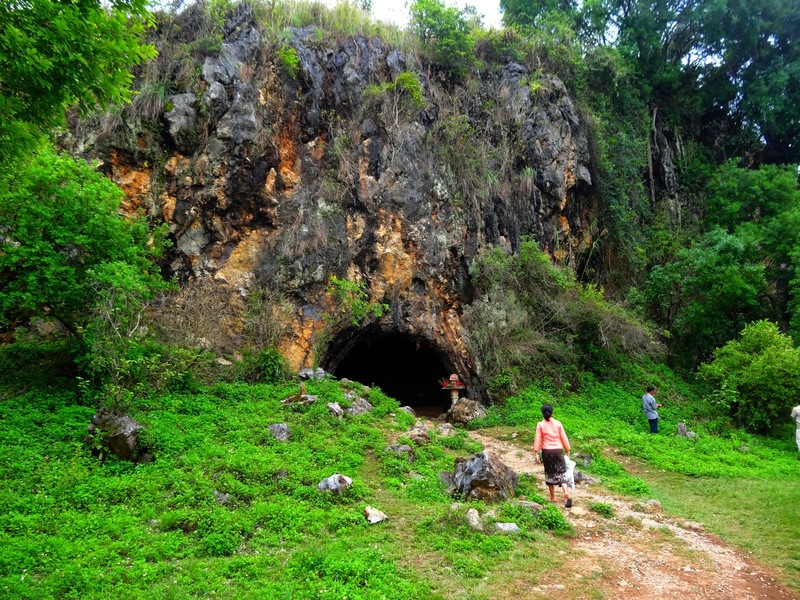 But much more interesting was this huuuuge cave just next to the Lagoon, where I almost got lost in the dark. Unfortunately a massive thunderstorm surprised us and we quickly had to land our hot air balloon after 30 minutes of flying around. But still better than not flying at all. That was a great read, excellent photos and thanks for mentioning my blog about the Secret War in Laos and modern-day backpackers in Asia! 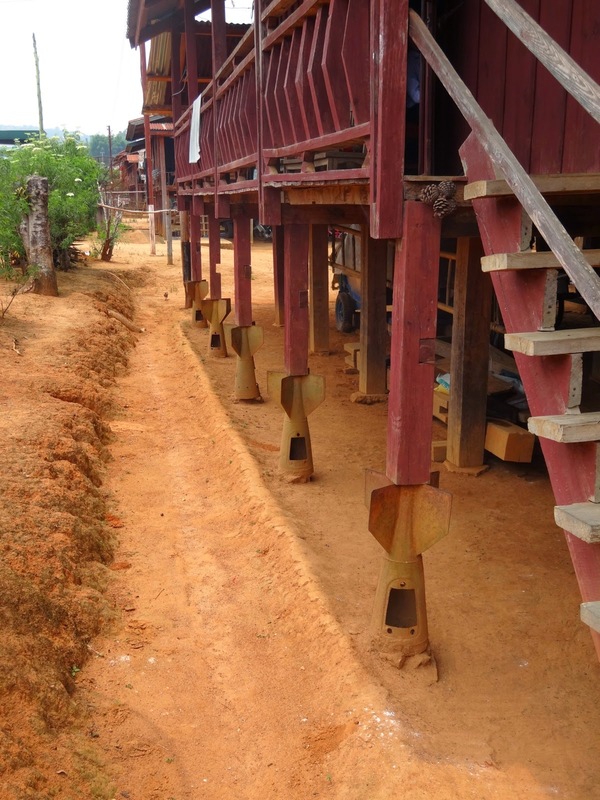 Where was the Thai camp in Phonsavan? Can you recall? Thanks. Hey Peter, it's an honor to have you commenting here; thanks a lot! 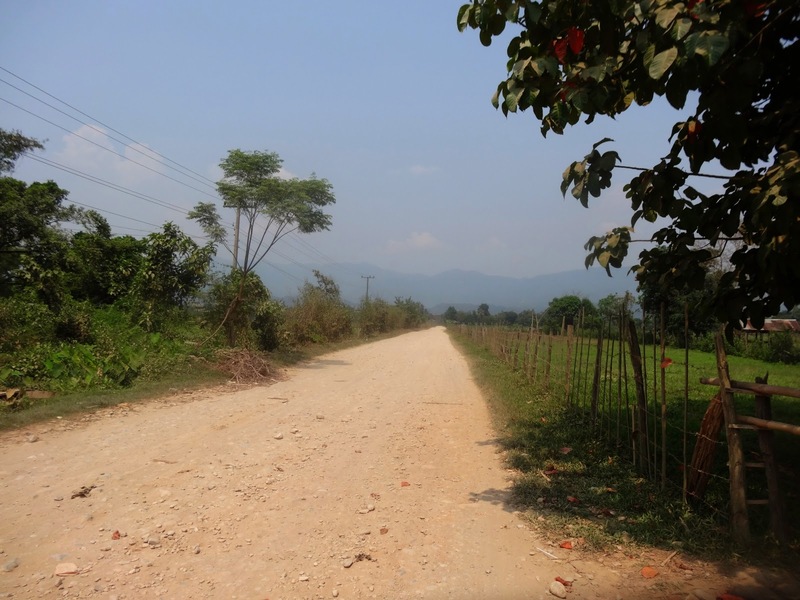 I'm sure you have been to Muang Souy village too, north-west of Phonsavan when you follow National Road 7. It's the town with the small lake, near the former CIA/Air America airfield and also the Hospital cave which you visited too. 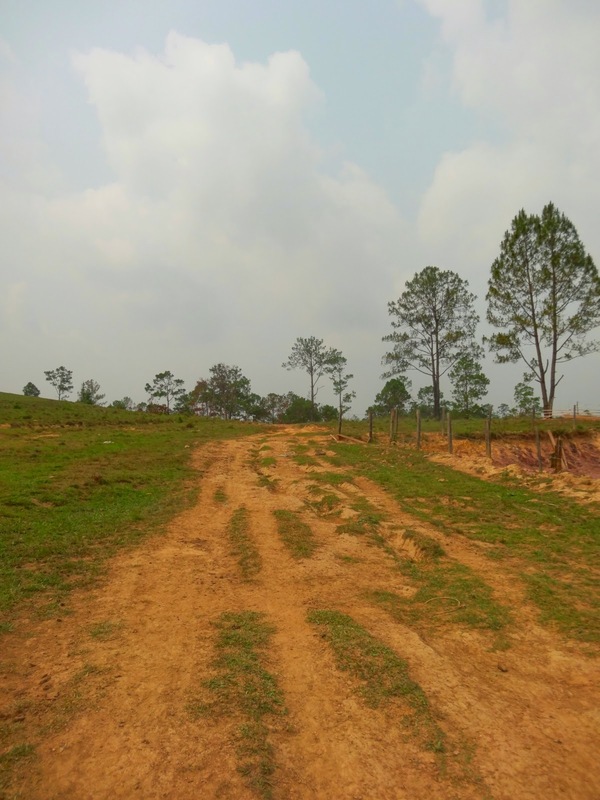 The former mercenary camp was somewhere along that National Road 7 in between, on the left side of the road if you're coming from the direction of Phonsavan. Where exactly, I really can't recall, sorry. It was kind of a agricultural field, even with some cows nearby. Kinda crazy if you consider again how contaminated this area is. 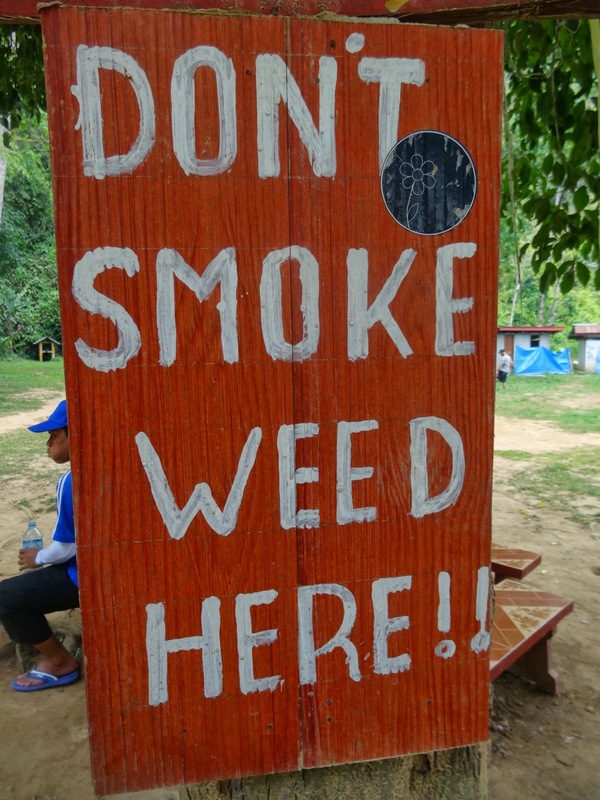 But next time just ask a guide in Phonsavan to take you to that "Thai Mercenary Camp" and knows where to take you to. 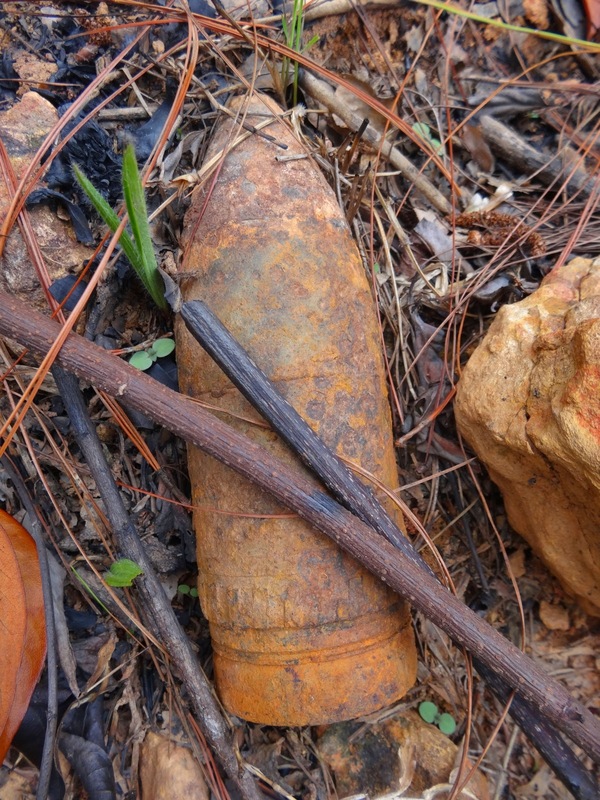 I highly suggest to go there with a guide anyway, considering the contamination of UXO and even landmines (according to that guide). 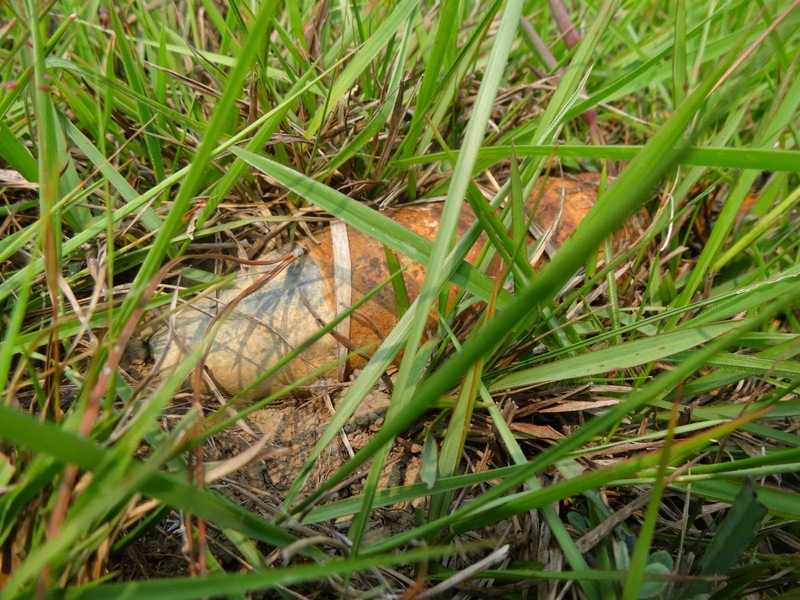 At some points in this field we even found some broken bottles of Thai origin. Temple overdose in the Kingdom of Cambodia! © by Muri. Powered by Blogger.